The cast and crew of A MIDSUMMER NIGHT’S DREAM would like to thank all who showed support for this venture into Shakespeare. Thanks especially to the patrons who donated funds to help make it it happen and to the audience who made each performance special! Also, a special thanks goes to Producer Jason Kramer, who gave life to the project in the first place. The group is hopeful they will return, in one form or another, in future years! The largely teen cast, which also consists of some young adults and youth, is a retelling of the classic Shakespearean comedy with themes of love and which contains plenty of mischief, theatre and of course, fairies. 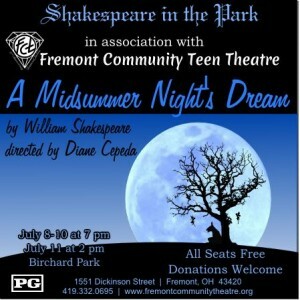 “A Midsummer Night’s Dream” will be presented July 8-10 at 7:00 pm and July 11 at 2:00 pm in Birchard Park. Bench seating is available, but feel free to bring a chair or even a blanket to sit on the ground! This is a non-ticketed event; however, donations are accepted and encouraged to defray the small cost of costumes, set, and water provided to the actors during rehearsal. Thank you! This play has a suggested rating of PG. A huge thank you to everyone who supported V IS FOR VARIETY, the first FCT original “spotlight production” ! FCT was proud to be the 400th confirmed reading of 8 worldwide. 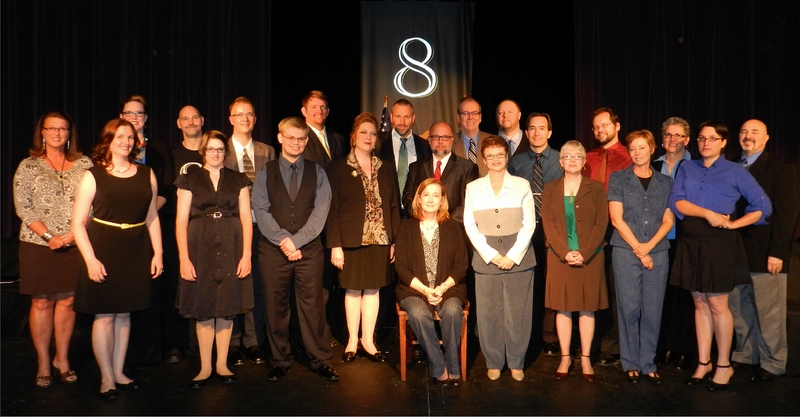 The cast of 8 performed 2 staged readings of 8 the play, that benefited the American Foundation for Equal Rights and Broadway Impact. The crowds responded amazingly to the show and the very educational talk back sessions that followed each performance highlighting the battle in America over marriage equality. FCT was bold in bringing an event like 8 to Fremont. Despite some objections, the overall reaction was overwhelmingly positive and compliments and thank you notes have poured into our email inbox. 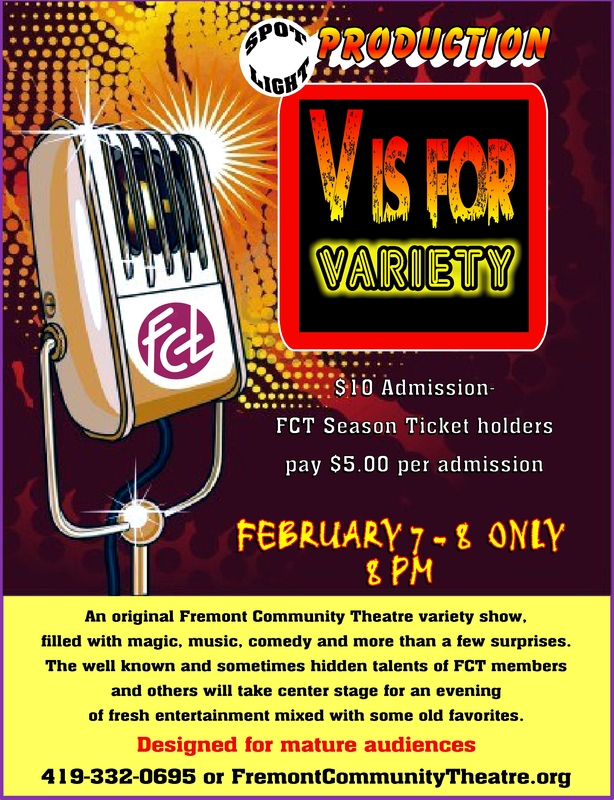 White FCT is still committed to bringing family friendly entertainment to the FCT stage regularly, more performances that are educational, entertaining, and possibly controversial like 8, certainly could be on the horizon in the future. Theatre can be so much more than comedy, songs and dance, it can educate and inform while entertaining. We thank all who supported this event. Donations accredited to FCT made to AFER may still be made by visiting the tickets tab above, Thank you!